Rob Hewison was a winner at March. I didn’t think the fishing could get any worse after last week’s indifferent results, but after a week of frost and bitterly cold nights, angling at the weekend was at a really low ebb. Thankfully the old Nene at March was the one saving grace. Despite anglers right along the match length having to break ice the roach responded with double-figure weights being taken. Leading the way with a fine 18lb 13oz was Rob Hewison. He drew on the clock tower in the centre of March and, despite his fears of a tough day’s fishing, it was solid with fish. He started on four metres to hand on the bread as usual and with the drain moving for the first hour he had a great start catching 100 roach in an hour. Then the flow stopped and the geese came along and broke more ice up. The trouble was with no flow it stayed in his swim. A switch to the long pole shot lining saw him have a late run of fish to see him home though with just over 300 fish for 18lb 3oz. Runner-up was Rob Wright, who drew one above the bypass bridge. He caught on a pinkie and squatt approach putting 16lb 8oz to the scales. Third place went to Dave Cooper. He was at Wigston Bridge and finished with 12lb 9oz. It turned out to be a Sensas Mark One rout as they took the top four individual places and they will certainly be looking forward to the Winter League final in late February if they can keep up this form. Half of the final will be on the fen drains including the Old Nene, with the other half on Decoy Lakes. Saturday’s Open match at Decoy Lakes did see some reasonable weights with anglers spread over several of the ‘strips’. 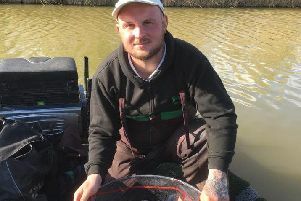 Rob Charlton recorded his first ever win at the fishery putting 53lb 11oz to the scales from peg 10 on the Oak, alternating between the feeder and pole. Second was Alan Quarmby with 25lb 9oz, then came Simon Godfrey with 17lb 8oz. I can’t remember Decoy Lakes fishing so badly for a very long time. I suppose it is the middle of winter though, so we should expect a few bad days at this time of year. We all know the fishery is one of the best in the country, but if the fish don’t want to feed, there is very little we can do. In the last round of the Barry Mason Winter League on the Beastie Pool at Decoy, John Whincup took the honours putting a very respectable 47lb 10oz to the scales from peg 30. Runner-up was Andy Leathers on 24lb 3oz followed by John Smalley with 21lb 2oz in third place. This series though is all about section wins, so despite Whincup putting in a fine performance on the day it was Martyn Freeman taking the league title with seven points - a very consistent scorecard considering the quality field of anglers and the conditions throughout the series. Jimmy Brooks came in second on eight points, beating John Whincup (also eight points) with a better total weight over the four matches.